Neck and back pain go back as far as recorded history and are still common complaints. In the past, treatment has been mainly activity avoidance and rest. The current research, however, shows that a different approach to neck and back pain is more beneficial. A review of the recommended treatment will be broken down into pain control, activity and action. Low back pain (LBP) is the fifth most common reason for physician visits, which affects nearly 60-80% of people throughout their lifetime. The lifetime prevalence of low back pain is reported to be as high as 84%, and the prevalence of chronic low back pain is about 23%, with 11-12% of the population being disabled by low back pain. 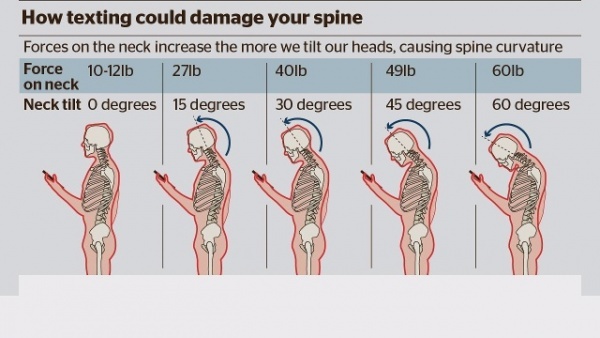 ‘Text neck’ is a modern age term coined to describe repeated stress injury and pain in the neck resulting from excessive watching or texting on hand held devices, laptops, or smartphones over a sustained period of time. It is also often known as Turtle Neck posture. It is a cause for increasing concern especially with younger generations given their greater propensity to mobile phone usage, but can affect anyone with increased device usage. Apart from neck pain, it can also cause shoulder pain, upper back pain, headaches and increased thoracic kyphosis. Neck and back pain are usually episodic and recurrent, with each episode typically resolving on its own. There are however a few simple treatment options to help control the symptoms and pain throughout the episode. They include: using painkillers (following the pharmacist’s and/or doctor’s instructions) and applying ice or hot packs. Seeing a local manual therapist (i.e. physio therapist, chiropractor) on a time limited basis is also recommended as they can provide some pain control strategies through hands on therapy and/or advice on some activities and exercises that can help control your symptoms and pain. Staying as active as possible is key to your recovery. Participating in a general exercise program and trying to remain at work or getting back as soon as possible are vital despite having some ongoing symptoms. The longer you stay off work the more likely you are to develop chronic pain and disability. Discuss your daily activities with the physiotherapist, whether it be leisure activities or work that you are having problem with to your care providers and employer to see if some temporary modifications can be made. Most people will get back to their normal activities within several weeks. If you are unable to after several weeks, you should definitely be seeking the assistance of your doctor, physiotherapist, and/or chiropractor.